SUBHEAD: A key pipeline loan is pending and banks are vulnerable to public pressure. We can it fight at any one of 38 banks. 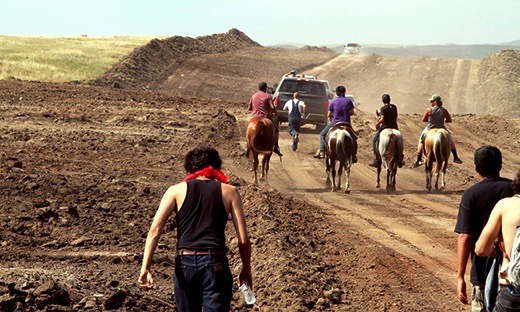 Image above: Standing Rock Sioux chasing away pipeline security trucks. Photo by Dell Hambleton. From original article. Most Americans live far from the path of the Dakota Access pipeline—they won’t be able to visit the encampments on the Standing Rock Sioux reservation where representatives of more than 200 tribes have come together in the most dramatic show of force of this environmental moment. They won’t be able to participate in the daily nonviolent battle along the Missouri River against a $3.7 billion infrastructure project that threatens precious water and myriad sacred sites, not to mention the planet’s unraveling climate. Maybe there’s a Citibank branch in your neighborhood. Or Wells Fargo or Bank of America or HSBC. Maybe you even keep your money in one—if so, you inadvertently helped pay for the guard dogs that attacked Native Americans as they tried to keep bulldozers from mowing down ancestral grave sites. Sporadic protests have begun at some of the banks—activists occupied a Vancouver branch of TD Bank and across the continent in Philadelphia held a protest outside another of the giant’s outlets. The same thing happened at a Citibank in downtown Chicago. “It’s unlikely that Citibank customers support poisoning indigenous peoples’ water, desecrating sacred burial sites, or contributing to global climate change,” said Gloria Fallon of Rising Tide Chicago. Which is true. But banks love these kinds of deals precisely because they’re so capital-intensive. (And because they’re financially stacked in favor of the developers: Federal tax breaks worth more than $600 million helped make the balance sheet for Dakota Access). The key Dakota Access loan, says Rainforest Action Network’s Amanda Starbuck, is still pending. It’s a multibillion-dollar line of credit, but only $1.1 billion of the loan can be doled out until the company “resolves certain governmental permits.” Citi, Mizuho, Bank of Tokyo MUFJ, and Mizuho Bank are leaders on that loan. Many of these banks may be vulnerable to pressure. For one thing, they’re eager to appear green: Bank of America, for instance, recently announced plans to make all its bank branches “carbon-neutral” by 2020. Image above: Name of financial source of credit/loan and receiving pipeline construction/operation partner. Created by Food & Water. From original article. Click to enlarge. Put another way: They’re going to be the vegan owners of a global chain of slaughterhouses. But there are success stories: Australian campaigners, led by indigenous groups downunder and working with campaigners across three continents, persuaded most of the world’s banks to stop bankrolling plans for what would have been the world’s largest coal mine and port, and in turn that has helped bring the project to a standstill. The pressure will increase after this week’s release of a new report from Oil Change International, which makes clear that the oil fields, gas wells, and coal mines already in operation have enough carbon to carry us past the 2-degree target the world set in Paris a year ago (and to absolutely annihilate the stretch goal of 1.5 degrees). Put another way: They’re vegans who will now be lending to tofu makers. But it’s probably sustained public pressure that will do the most good. That is to say: At this point anyone who finances any fossil fuel infrastructure is attempting to make money on the guaranteed destruction of the planet. So those Dakota Access loans should come under new scrutiny—moral, as well as financial—since they assume that governments won’t enforce their Paris promises. That’s a gamble accountants might want to think twice about, especially after this week’s news that the SEC was investigating Exxon for its refusal to write down the value of its reserves in light of the global accords. • Bill McKibben is the Schumann Distinguished Scholar at Middlebury College and co-founder of the climate group 350.org. He is a YES! Magazine contributing editor. Twitter: @billmckibben.